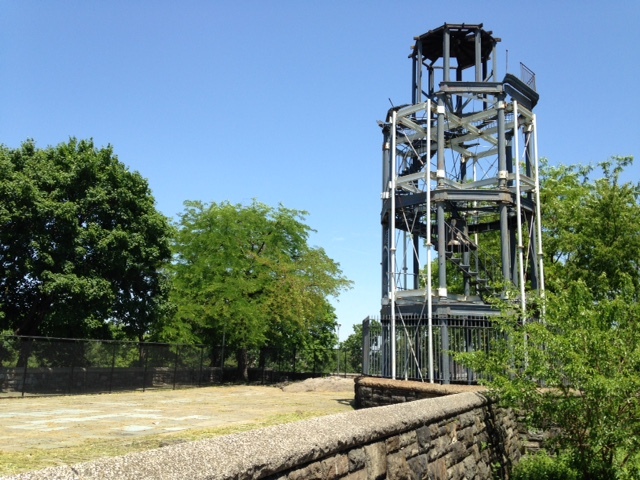 The dismantling of the fire watchtower began back in the first week of December 2014 when the security fencing was installed. 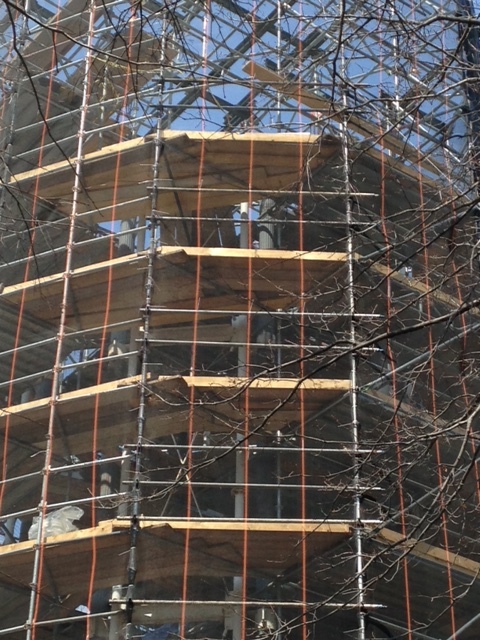 The scaffolding was installed over several weeks in December and January and then because of winter weather and icy conditions work was halted. During this time crates were built for storing the individual cast iron pieces of the fire watchtower and the crates were clearly visible in the staging area. 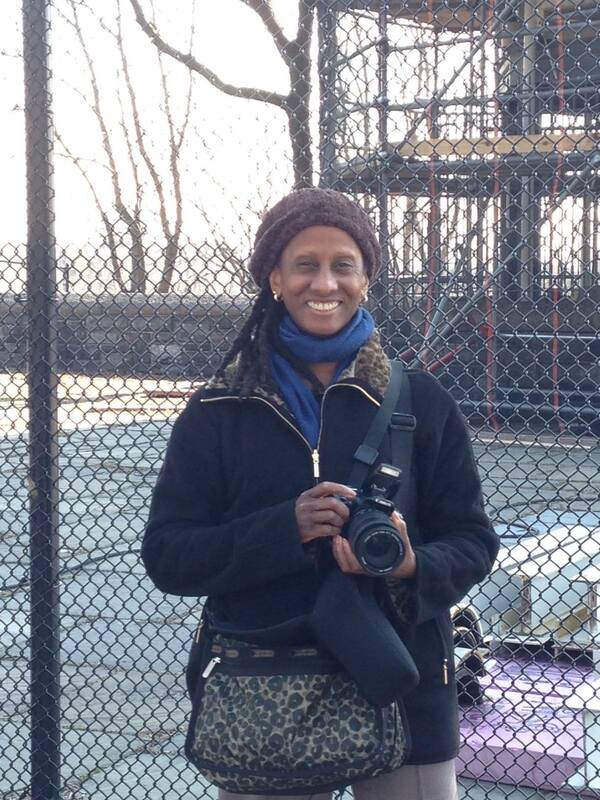 MGPAlliance Secretary Cynthia M. Reed, camera in hand documenting the restoration of the fire watchtower that sits atop of Mount Morris in Marcus Garvey Park. 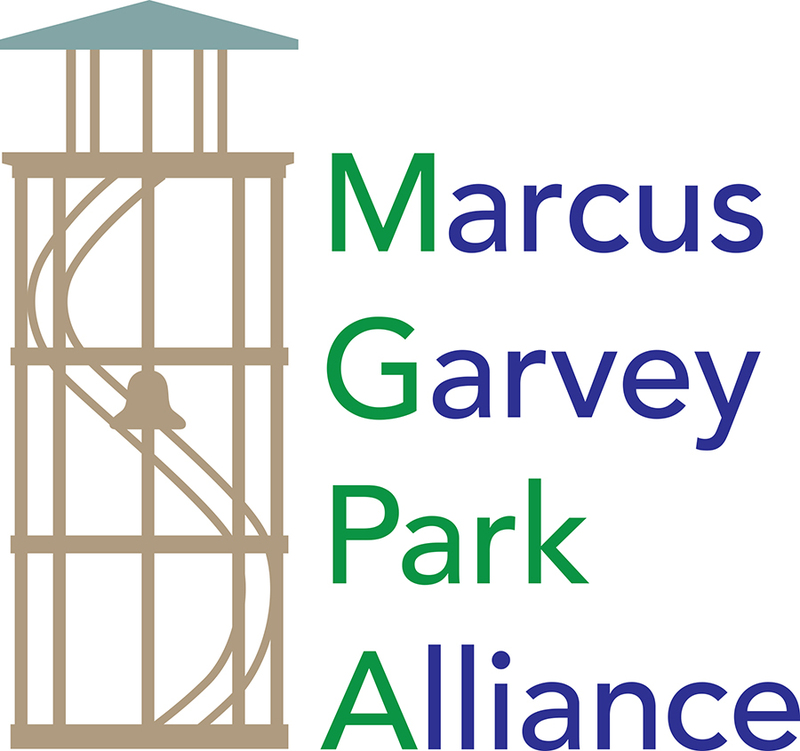 On March 20, 2015 the dismantling finally began and on April 2 2015 several community residents including Connie Lee, President of the Marcus Garvey Park Alliance, Cynthia M. Reed and Chet Whye walked up to the Acropolis to check on the progress. Chet Whye Director Harlem4 Obama and MGPA President Connie Lee with the fire watchtower in the background. There were 2 men working on the Acropolis level and a few men were up on the tower working on the dismantling. A Cast Iron Piece of the Fire Watchtower being brought over to the platform where it will be lowered down and crated. 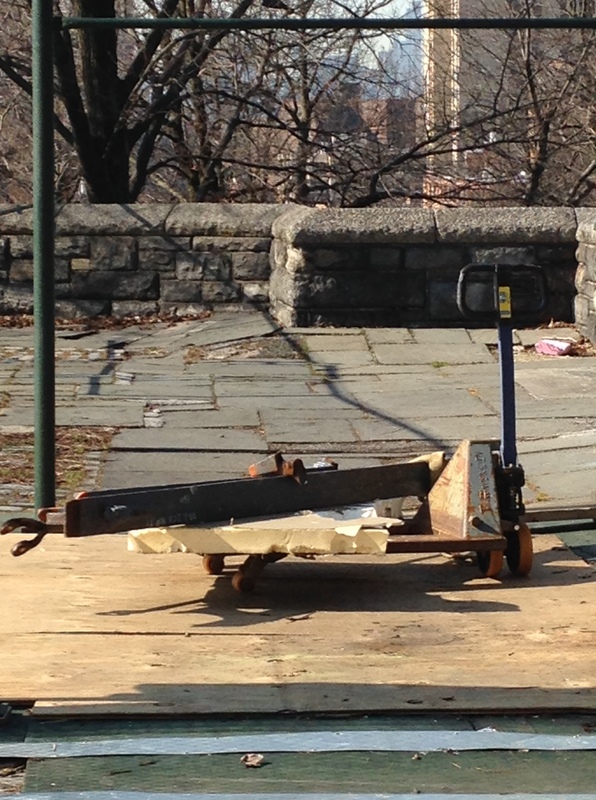 The piece pictured right was brought down and moved into position to be loaded onto the platform. Once lowered down from the platform onto the roadway pieces are put into crates. 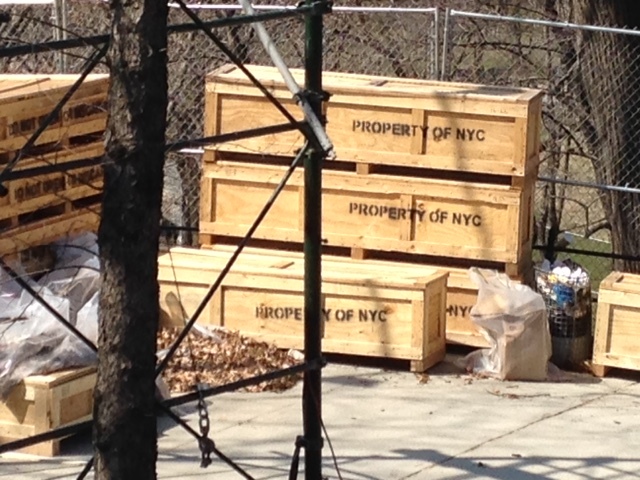 Crates ready to be filled with individual pieces of the fire watchtower and transported to Fort Toten for storage. The project manager came up to the Acropolis while we were there but seemed to go out of her way not to engage. We would have loved to ask her a few questions like how much longer will the dismantling take or has the contract with Nicholson & Galloway been extended? On Sunday April 5th we went back up to the acropolis to see how much work had been completed. It is usually difficult to see through the mesh that surrounds the scaffolding but at this time of day just a little before noon the light was coming straight down giving us a pretty good view of the progress. This photo clearly shows that the roof and top level have been removed. If you look closely you can see the columns on the fourth level are still in place. On the ground we noticed the old wood planks that would have made up the roof and possibly the deck on the upper level. 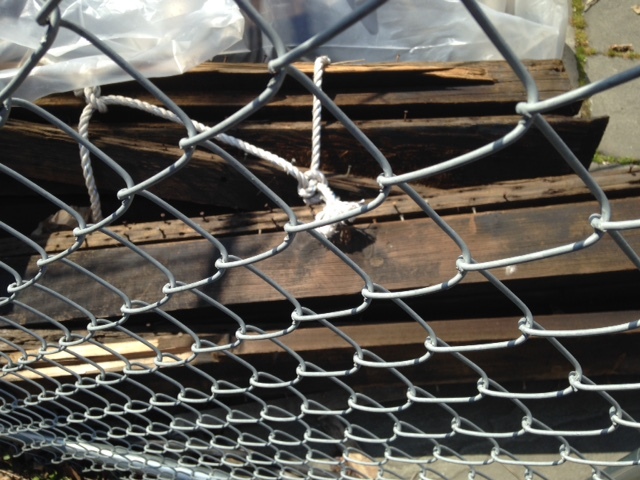 Wood planks removed from the upper level of the fire watchtower. 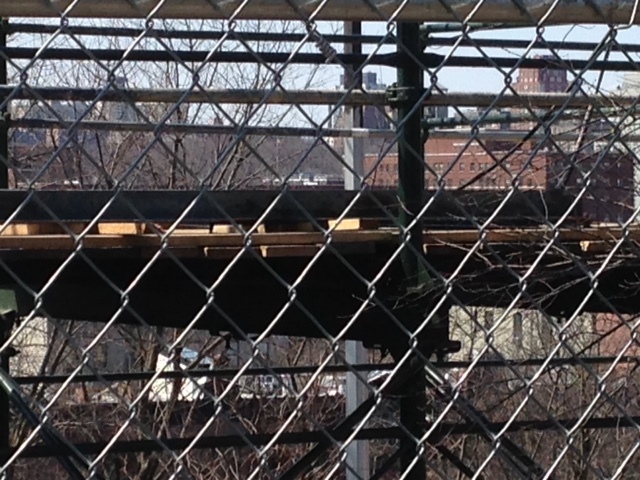 A cast iron piece that most likely came from the upper level was left on the platform presumably to be lowered to the roadway and placed in one of the crates when the contractors return on Monday. 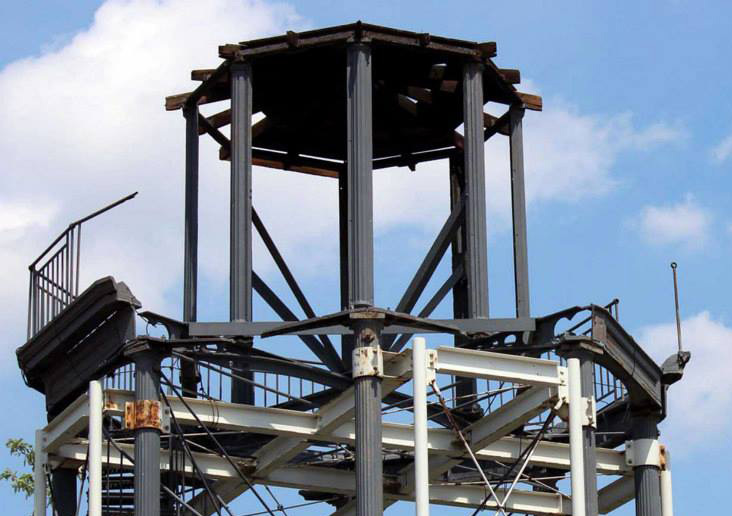 A cast iron piece that has been removed from the fire watchtower sits on the platform waiting to be lowered to the roadway to be put into crates. It is hard to imagine the tower not being there but sometime this Spring the dismantling will likely be complete. Many community residents have expressed concern about safety up on the Acropolis so stay tuned as we work on ideas and collaborations to activate the Acropolis and keep it a safe and inviting place for community residents.